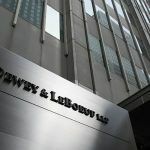 In a ruling relieving hundreds of ex-Dewey partners of millions of dollars in liability, a New York state judge has ruled against a former landlord of Dewey & LeBoeuf, which took action over unpaid rent. A New York state judge has dismissed charges of grand larceny against two former Dewey & LeBoeuf executives, leaving only three minor charges to go to trial this September. US prosecutors have told a New York judge of new guilty plea deals offered to three senior Dewey & LeBoeuf executives after the criminal case over the biggest law firm bankruptcy in history collapsed recently. While acting Supreme Court Justice Robert Stolz has declared the criminal proceedings against the former executives of now defunct firm Dewey & LeBoeuf a mistrial after three weeks of jury deliberations, the case may now be headed for a retrial. A Manhattan jury has found former Dewey & LeBoeuf executives Steven Davis, Stephen DiCarmine and Joel Sanders not guilty on multiple criminal charges related to the largest law firm collapse in legal history, although it is still deliberating a number of more serious charges. The long-awaited trial against three former Dewey & LeBoeuf executives, which will in part probe the causes behind the largest law firm collapse in legal history, started yesterday (26 May) concerning allegations the trio committed criminal fraud and altered accounts in a bid to prevent the firm’s demise. The long-running investigation into the collapse of Dewey & LeBoeuf shifted up a notch today with the announcement that three top executives and a client relations manager at the now defunct firm have been charged with fraud.